'Belvi Queen' (Carol Jensen, R. 1975). Seedling# DR 12-13. TB, 43" (109 cm), Early bloom and rebloom. Standards cinnamon, edged darker; falls white blaze on yellow inlay, maroon stitching around edge; gold beard. 'Summer Fantasy' X 'Villa Gold'. 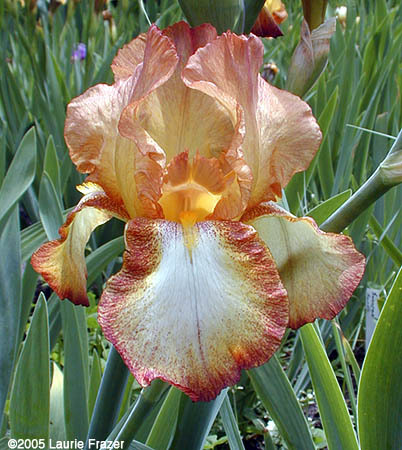 Jensens' Reblooming Iris 1976.